Successful military operations rely on quick and precise logistics support. Advanced computing devices are used to monitor the military logistics inventory and supply flow efficiently. The 12.1” Panel PC with integrated projected capacitance can function optimally despite harsh environments where military ops take place. Military logistics is more than just supply lines and taking the needs of the military forces. They ensure that personnel on the frontlines have what they need to succeed in their missions [Military and Aerospace]. So, they need to streamline the logistics operation to run efficiently. Thanks to the advancement of technologies, military logistics became an easy task. Technological innovations like advanced panel PCs with projected capacitive touchscreen features are amongst the most recommended equipment for the military. In fact, installing an S12 industrial computer with projected capacitance touchscreen can have the best specifications needed for logistics operations. Its built-in capacitive touchscreen technology offers a reliable interface. It can accurately detect multiple touchpoints and quickly responds user to input. This means that this device is suited for military logistics, which bears a fast-paced work environment. However, does this device have the longevity and functionality required in military applications? Read more unto this blog and understand why the S12 industrial-grade PCs best fit the military logistics operations. Military operations leave no room for errors. Therefore, utilising the most reliable computing technology is a must-have for efficient military logistics. Its many features can be used to track critical military logistics operation accurately. Panel PCs with 12.1” capacitive touchscreen displays are not only offering better functionalities. However, this device is also scratch-, dust-, and water-resistant. So, it can be used even in the presence of potential risks such as water, dust, and scratches due to frequent usage of the device. Also, it is built with the WindowsTM IoT Enterprise operating system. This system offers maximum compatibility with military software. Its upgraded security features and enterprise manageability options make it the best platform for military logistics applications. Now, what makes the S12 panel PC different from any other enclosed PCs? Find out more about the best feats of this device for enhancing military logistics ops. What are the qualities needed for a military computing device? Take a look at the comparison chart below and determine which one has the best features. Upon looking at the chart, it is clear that our rugged S12 panel PC with projected capacitance bears the requirements needed for military applications. Since it comes with the Intel® Baytrail-M/D™ J1900 2.00Ghz processor, it can analyse large volumes of data quickly. Its Intel® Optane™ Memory Technology feature also accelerates overall performance and responsiveness of the device. Rest assured that a logistics personnel can accurately keep track of the military supplies and inventory as well. Moreover, this device is enclosed in an IP69K stainless steel casing. This prevents hardware damage for water, dirt, and dust. This feature also protects the device’s critical components from strong external vibration. Thus, ensuring that the device remains operable despite being hastily transported through rough terrain. Achieving efficiency and effectiveness in logistics require a reliable and advanced computing technology. Fortunately, our panel PCs has the specifications needed for active military operations. So, expect that this device can provide better functionalities and ease of use in military logistics. Contact one of our industrial PC manufacturers today for more information about our products. 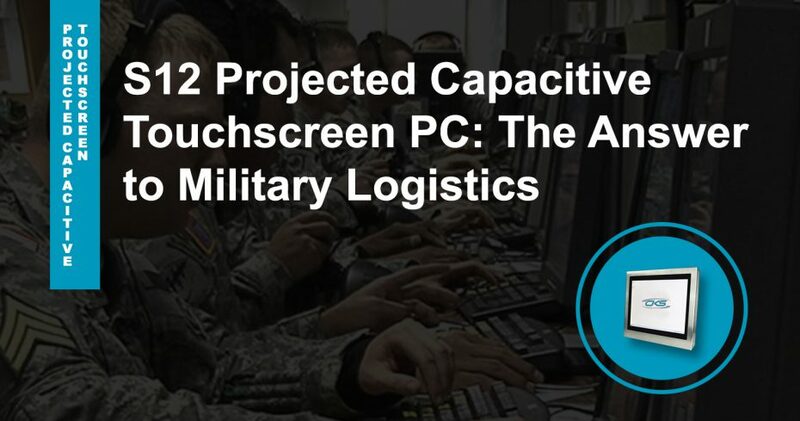 Start modifying the military logistics operations using the S12 projected capacitive touchscreen PC.